Some people collect stamps. Other people collect coins. 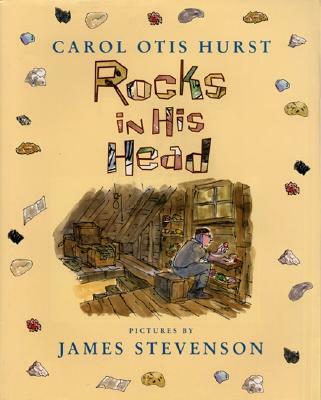 Carol Otis Hurst's father collected rocks. Nobody ever thought his obsession would amount to anything. They said, "You've got rocks in your head" and "There's no money in rocks." But year after year he kept on collecting, trading, displaying, and labeling his rocks. The Depression forced the family to sell their gas station and their house, but his interest in rocks never wavered. And in the end the science museum he had visited so often realized that a person with rocks in his head was just what was needed. Anyone who has ever felt a little out of step with the world will identify with this true story of a man who followed his heart and his passion. Carol Otis Hurst is a storyteller, teacher, children's book critic, and columnist for Teaching K-8 Magazine. She is the author of the Boston Globe-Horn Book Honor Book Rocks in His Head. James Stevenson is an op-ed contributor to the New York Times. His popular column, "Lost and Found New York," has appeared regularly in the newspaper since 2003. He was on the staff of The New Yorker for more than three decades; his work includes 2,000 cartoons and 80 covers, as well as reporting and fiction. He is also the author and illustrator of over 100 children's books. He lives in Connecticut.